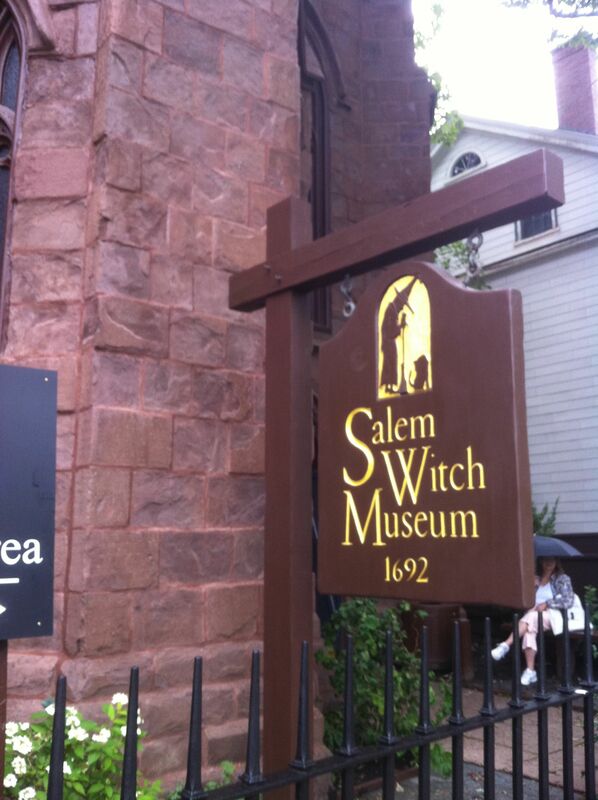 One rainy day in Massachusetts, we decided to take a trip to Salem to check out the history. My husband, who has known me for over eight years, learned of my fascination with witches and the Salem Witch Trials and agreed to take the 30-minute drive from Gloucester to explore the town. Once we mentioned that we were going to Salem, everyone said that we just HAD to go to Salem Beer Works and try their fried pickles. Fried pickles?! You had me at hello. We made our way down 128 and settled in for a morning at the Peabody-Essex Museum, which had a fantastic exhibit on ManRay and Lee Miller (seriously, check it out if you’re in town) and a fun, interactive exhibit on water. After a little culture, we headed over to the big event: the Salem Witch Museum! I was so excited. Following a lackluster, but slightly interesting tour of the museum, we headed to the Beer Works for a late lunch. While we knew the fried pickles were a definite, we checked out the beer menu to select our beverages. 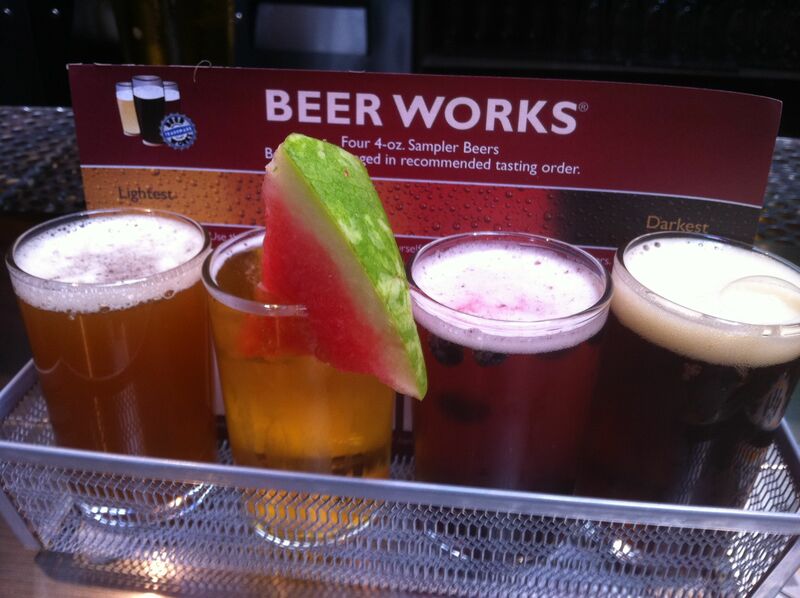 We had heard chatter of a tasty watermelon beer but I was drawn towards a few different options and ended up with a pick-your-own flight while my husband opted for a 12oz pour of the Victory White. My flight ranged from Witch City Red and Watermelon Ale to a Bunker Hill Blueberry Ale (made and garnished with Maine blueberries) and a Cask IPA. I’m no beer expert like this guy but I enjoyed each of them, especially the light and playful watermelon ale and the blueberry ale, which had some richer flavors. The cask IPA was mellow and more drinkable than I expected. Best of all, the 4 ounce pours were only $1.50 each so I got the whole flight for $6. What a deal! We each ended up opting for two of their many burgers, after seeing the construction workers to the left of us devouring theirs with gusto. I went with the Charlestown Burger topped with bacon and cheddar and he went all out with the Fenway topped with chili, scallions and cheddar. 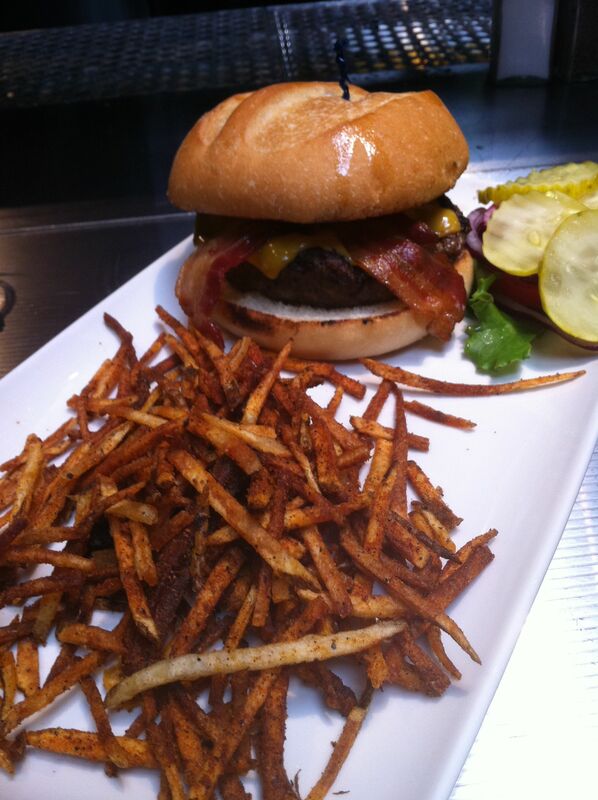 The Beer Works has a ton of different french fry cuts and seasonings, any of which we could pick to accompany our burgers. I went with the potato sticks while he opted for the more traditional hand cut fries. The pickles were actually whole spears battered and fried with a ranch dipping sauce. While I expected them to be sliced, I certainly wasn’t disappointed. The creamy ranch, hot and crispy coating and warm, sour pickle all did a little dance in my mouth together. What great beer drinking food! The burgers followed and were top notch. Mine was cooked to a perfect medium–something I’ve had trouble finding these days. 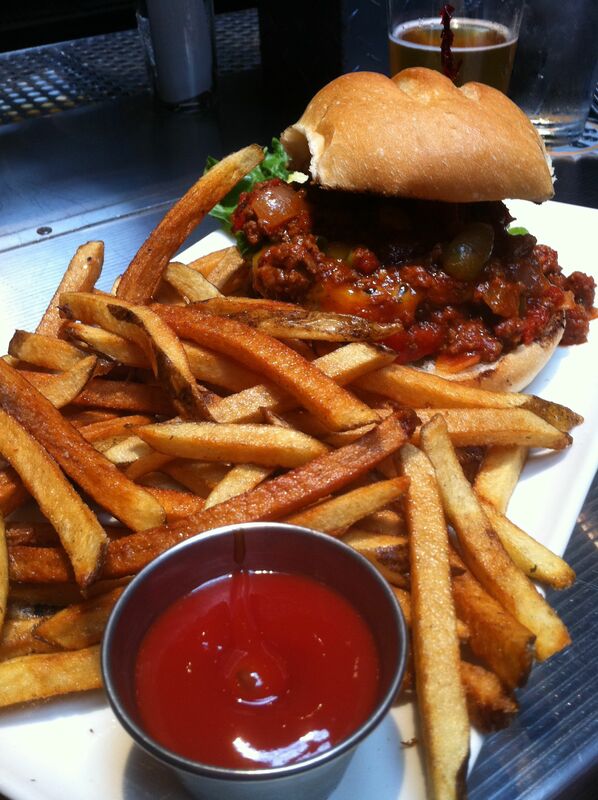 My husband’s burger was messy but received two chili-smudged thumbs up from him. And I got over my fry disappointment by eating most of his. Look at all that chili!! After finishing lunch, we picked up to six-packs to go (for under $9 each!) They also offer growlers but we were walking around and they were a little less portable. We headed over to my tarot reading and I’ll find out in 4-7 months if any of the work, health, financial and travel predictions she made are true! 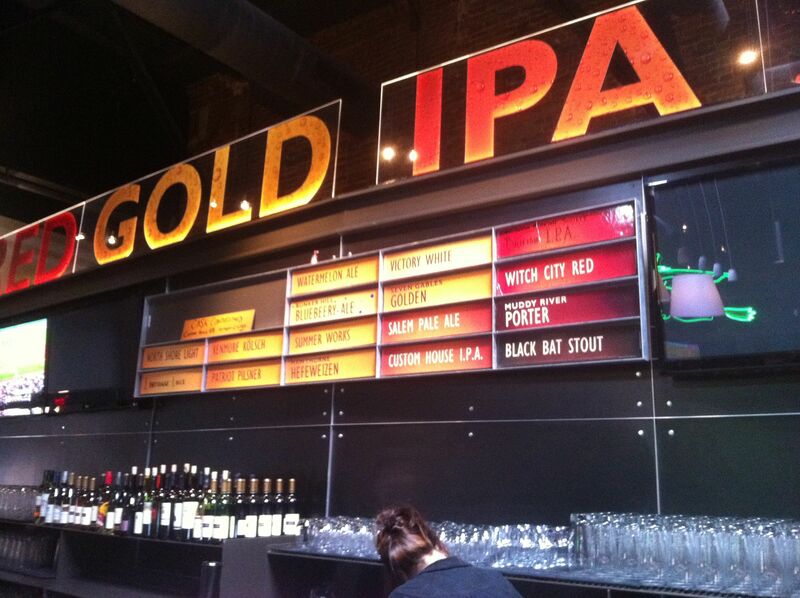 Beer Works has a number of locations around Massachusetts, including one across from Fenway Park. 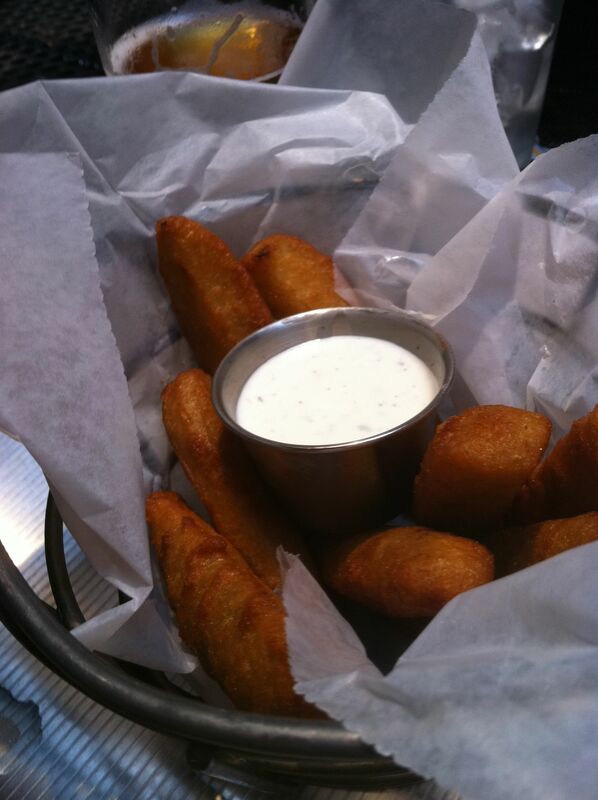 Stop in and check out the fried pickles if you’re ever in the neighborhood! La Rosa Pizza: Potato Pie! Hey, thanks for the linkage! Also, that’s almost exactly how they do the fried pickles at Memphis Taproom, which are delectable. The food at this place looks awesome, especially those burgers, and the beer sounded good as well. To a point, that is – I can tolerate fruit beer, and even like some of it, but putting actual fruit in the beer is taking it a step too far. It’s gimmicks like this that make me think they’re trying to hide something or cover it up with a slice of watermelon.